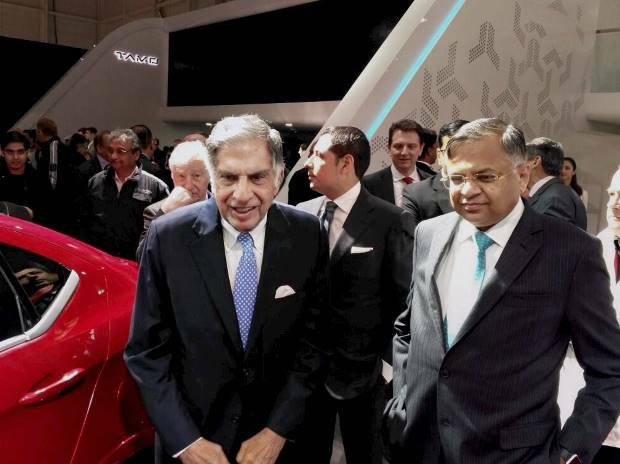 Chairman emeritus of Tata Sons, Ratan Tata (left) and Tata Sons Chairman Natarajan Chandrasekaran pose near TAMO Nexon, being showcased at the 87th Geneva International Motor Show in Switzerland. From the humble Indica 20 years ago to the sports car RACEMO, Tata group Chairman Emeritus Ratan Tata feels that it has been "a worthwhile journey" at the prestigious Geneva motor show. From the company's first passenger car in 1998 to the sports car under the company's new sub-brand TAMO, Tata Motors is marking its two decades of participation at the auto show with a leap of faith to future. "The cars are fantastic," Tata, who came to the show after a gap of four years, said while commenting on the products displayed by the company. Besides the RACEMO, the company is showcasing the special editions of its next generation product line-up in the compact segment — sedan TIGOR and SUV NEXON. When asked to reflect on the experience in Geneva, Tata told PTI: "The journey has been worthwhile." The blip in the journey, however, is the ill-fated Nano, which made global headlines in 2008 when it was displayed here. The car, which promised to change personal transport in India, at a price tag of Rs one lakh, could never live up to the expectations as sales never reached what the company had estimated. Tata Motors also had to witness violent opposition to the setting up of the Nano plant at Singur in West Bengal and was forced to shift it to Sanand in Gujarat. When sought for his comments on Nano, Tata did not comment. The ousted chairman of Tata Sons, Cyrus Mistry, had alleged that Nano has accumulated losses of over Rs 1,000 crore and the company has been unable to shut it due to emotional reasons and conflict of interest. The Geneva International Motor Show has also seen Tata Motors displaying Pixel, a city car concept for Europe and Megapixel that showed the company's future design direction in 2011 and 2012. Last year, the company had showcased hatchback TIAGO and the compact sedan TIGOR, under the codename Kite 5, along with HEXA Tuff, a personalised version of the recently-launched HEXA.